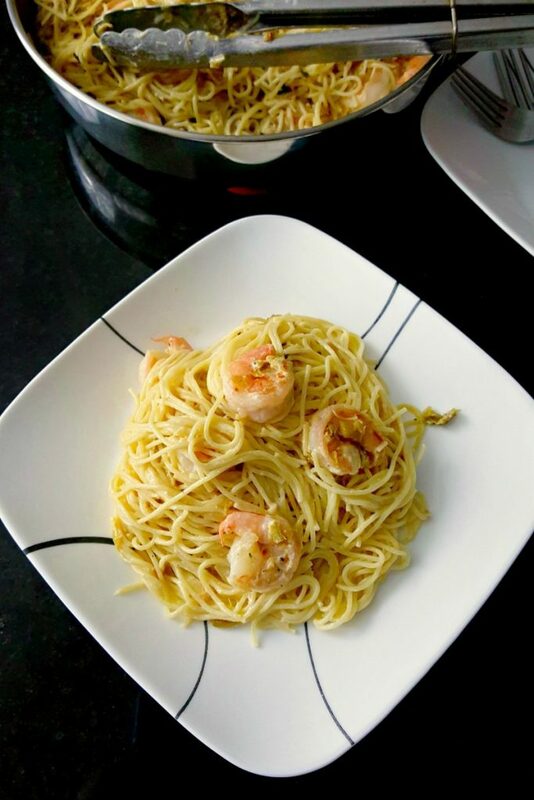 Pasta Carbonara with Shrimp and Leeks is a fast paced recipe that tastes amazing and is on the table super quick! The eggs combine with the cheese to make a silky smooth sauce for the pasta. There are very few ingredients that span the globe like eggs do. Honestly. Eggs are probably used in almost every country across the globe. Unless they worship chickens, then, maybe not. Or if they’re strictly vegan then probably not gonna find eggs in their recipes. But, I don’t know of any countries that are strictly vegan. Are there? Eggs are across the globe! I actually have a Pinterest board that’s all about egg recipes. I am planning a whole series of global egg recipes. That’s why some of the pins look sort of weird; there’s not great pics of some of the dishes I’ve been looking at. There’s fried, hard-boiled, coddled (in a coddler that’s usually cooked in a water bath), baked, omlette, poached, scrambled, pickled, and deviled. Then there’s the croquet madame (croquet monsieur with a fried egg), egg curry, egg foo young, eggs in a basket, egg drop soup, and eggs benedict. Then there’s soufflés, stratas, and frittatas. I feel sort of like Bubba in Forest Gump. Eggs and brains. Yeah, not making this one. Loco Moco. Menemen. Scotch egg. Man those are good. Tamagoyaki. So gonna make that one. Khagina. Shakshouka – SO GOOD! Then there’s egg custard, meringue, egg tart, divinity, pavlova, and pasteis de nata for desserts. Okay. So, you get my point. There’s a TON of recipes for eggs all across the world. #SundaySupper is represented quite a few countries with this week’s list of delicious dishes using eggs. We’ve got deviled eggs a plenty. There’s Scotch eggs, frittatas, egg crepes and a few benedicts for your chosing. And dessert offers up flan, croquembouche, and pavlova. So, I think we’ve covered all the bases and spanned the globe this week. For me, when I saw that eggs were the subject of this week’s #SundaySupper I immediately wanted to make a carbonara. It’s not like I haven’t made a few already, but it’s definitely a go to egg dish for dinner. My first attempt was a couple of years ago. Please disregard the photos. We were living in the cave back then. That’s when I became addicted to this technique. After making your basic carbonara, I branched out to more interesting flavors and textures. Thinking outside of the box, I made a mushroom and ravioli carbonara. The sauce coating the ravioli is so delicious. By changing up the different types of pasta, you can create different types of carbonara. Then I got on this scallop kick so I made one with scallops. You could make the traditional bacon and pea carbonara or add some other protein, like my scallops. You could toss in some grilled chicken, left over roast beef, even some carnitas for a mash-up recipe. Change out the parm for cheddar and toss in some hot dogs for a kid friendly recipe. Finally, there’s oh so many herbs and vegetables you could toss with that delicious pasta. Our farmer’s market had some delicious lemon basil so, of course, I had to try that one! Then there’s lovely, fresh spring pea and ricotta. The ricotta adds a silky creaminess to the sauce that elevates the egg and parmesan blend. It’s so good. You have to try it! You could sub our the Parm for something a little different like a fontinella cheese. I think this one was my second favorite. And, finally, there’s my ultimate favorite; roasted Brussels sprouts. Those sprouts are all earthy, slightly bitter, and oh so sweet! It’s the perfect pairing with salty Parm and creamy eggs. I think I need to put this one on the menu for our next meatfree meal. Yup. I’m addicted to carbonara. This story is going to take a side step. Bear with me. Dad and DSM (dear step-mother) went to the home and garden show a few weeks ago. Dad wants to redo his house before they retire and sell. Which makes sense. Some of the cosmetic things need to be fixed. So, they went with us, got some ideas of their own, and we headed to lunch. After lunch, Dad said that Harris Teeter had a sale on shrimp. If you buy two bags, you get three free! So, that’s 10 pounds of shrimp for like $35. Now, when we entered into this bargain, we thought we were splitting the cost, but getting three bags. Little did I know… We leave the store and Dad just doesn’t want the money to split the costs. He was buying two bags and just gave us the other three for free. Told you this was relevant. So, there I was thinking about carbonara and remember we had shrimp in the freezer. Oh yeah, then there was the leeks that I confited – is that even a word – just to get them out the way. And there ya have it folks, my recipe was born! Necessity is the mother of invention, right? And this dish is necessary! If you follow the steps in order, have your ingredients ready to go, this dish goes together wicked fast. It’s perfect for those nights were you so so SO tired and just do not want to cook. Grab a bottle, glass, or tumbler of your fave beverage and just get to work. You’ll won’t regret putting this one on the table. The shrimp are succulent, the leeks are earthy and sweet, and the pasta is creamy and slightly salty. It’s the perfect combination of flavors and textures for a weeknight dinner. Have you tried to make carbonara? What’s your favorite recipe? Combine the first six ingredients (egg substitute through nutmeg) in a small mixing bowl. Set aside. While the water is heating, preheat a large skillet coated with cooking spray over medium-high heat. Add the leeks and sauté until tender about 7 to 10 minutes. When the water reaches a full, rolling boil, drop in the pasta, stir, and lower the heat just slightly so it’s not boiling as hard. Stir occasionally. Once the leeks are soft, remove from heat and keep warm. Spray the skillet again and heat over high heat. Add the shrimp and cook 1 to 2 minutes per side or until pink and no longer opaque in the middle. Return the leeks to pan and keep warm. Once the pasta is cooked to your liking, drain reserving 1/2 cup of the pasta water..
Place the hot pasta in a large mixing bowl. Drizzle the egg mixture over the pasta, stirring constantly, until the cheese has melted. If it appears to be dry, stir in the pasta water a little at a time until a creamy sauce forms. Toss the shrimp and leeks with the pasta before serving. So elegant! That is the perfect dinner in my book. Thank you! It was pretty tasty! 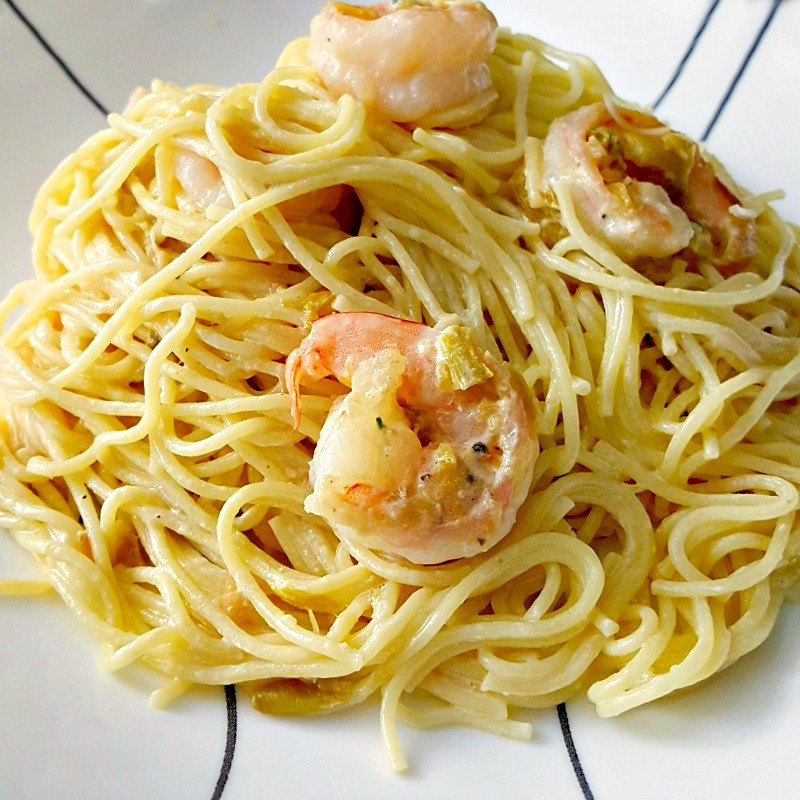 I love shrimp and pasta! YUM!! Thanks, Sara! So do we! Carbonara is the ultimate! I love all the suggestions you have for jazzing this up even more. Thanks, Laura! It’s so quick, easy, versatile, and delicious! 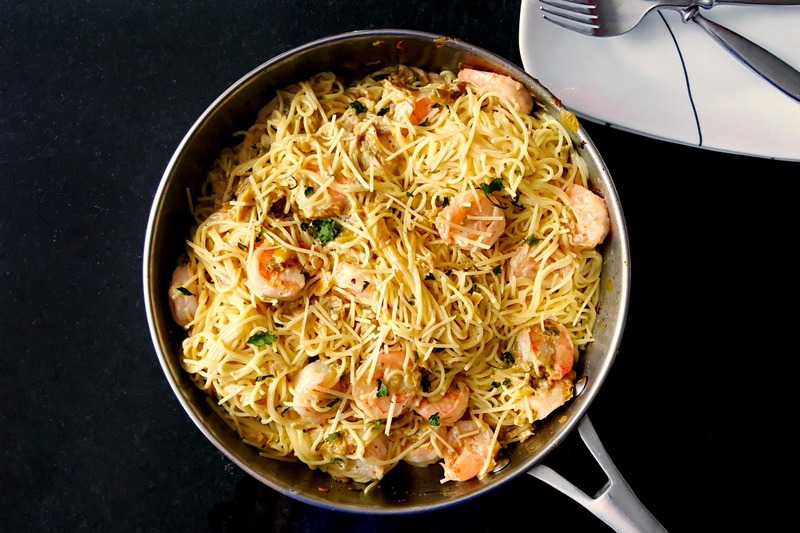 I love shrimp pasta. Yours looks delish! Thank you! 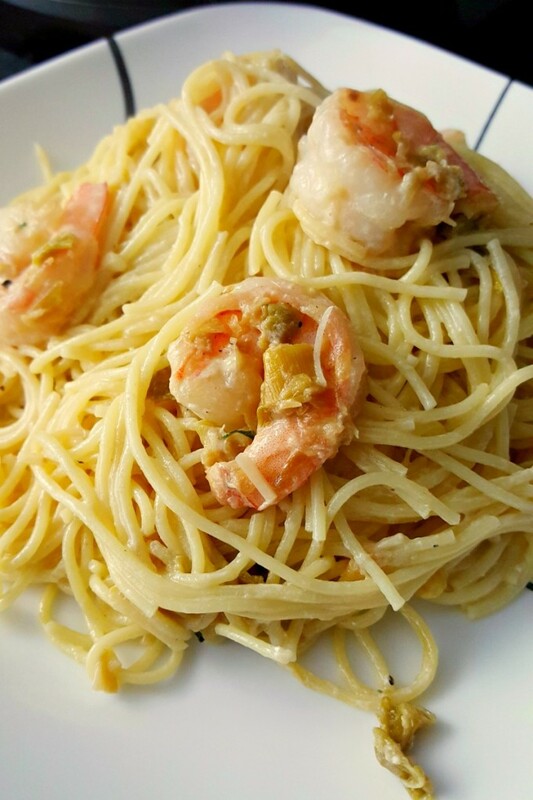 We love shrimp and pasta, too. Quick and delicious. You hooked me with shrimp and then reeled me in with the carbonara! Thank you! You’re too funny, Cindy! Thank you, Caroline. 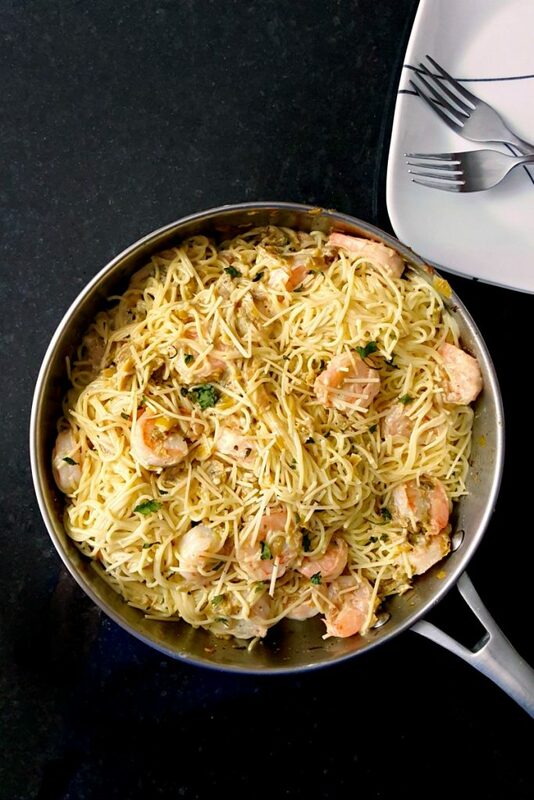 Shrimp works really well in carbonara. You are so right, eggs are essential to every cuisine. This carbonara looks great! Thank you, Kristen! It’s amazing how each culture cooks eggs.